Ginger.io Review – Work at Home In The Mental Health Industry! Published August 9, 2018 By Anna J. This post may contain affiliate links. Regardless, I only recommend sites I've researched and/or used and trust. If you’re in the mental health care industry, you know that many people don’t like to ask for help, and those that are brave enough to make an appointment with a therapist may find it hard to get out of the house to actually go to said appointment. Mental illness – or even just knowing you need to talk to someone professional – can be a debilitating feeling of powerlessness. It of course does not have to be that way, and the creators of Ginger.io realized that back in 2011 when it was incorporated in San Francisco. Ginger.io is, according to its website, a “licensed, nationwide medical provider that offers emotional and mental health support,” and provides “in-the-moment support,” and “a full spectrum of care” – meaning, medical professionals reply to patient messages within minutes, not hours. Patients work with their therapists to set and achieve goals, engage in self-awareness, and can even work with psychiatrists to manage their medication. All patients need is a smartphone! The founders of Ginger.io realize that there isn’t a one-size-fits-all approach to therapy, so they work with patients to design a personalized plan to use as the patient is being cared for. This plan combines the best of both worlds, using therapist recommendations along with technology to develop and tailor a plan specific to the patient. Ginger.io utilizes “measurement-based care,” meaning that they track progress using data science, and comply with HIPAA protections by ensuring all information is confidential and secure. The significance of this is that the app is technology-based, and while 40+ hospitals were using Ginger.io’s tech, rebranding as a mental health app allows its technology to be more readily available to help those in need – fitting nicely in line with the company’s mission of changing the world. According to the company’s website, “Fast Company called Ginger.io one of The World’s Top 10 Most Innovative Companies in Healthcare and the World Economic Forum,” and “named us a Technology Pioneer.” Pretty impressive. There are a plethora of obvious benefits to patients who utilize Ginger.io’s services, but the main takeaway that makes this company unique is that it allows its therapists to work remotely. This means that therapists can really work anywhere in the U.S. without being concerned with patient location or means of transportation (with the slight caveat of licensure). Details on Ginger.io's remote jobs are below. Ginger.io seems to be branding itself still very much in the vein of being a tech tool for therapists by allowing them to increase their patient load. Psychiatrists can utilize the video service of the app, track their patients’ progress, work with other therapists and coaches, keep records, conduct evaluations/assessments, and provide tele-psychiatry. Psychiatrists must be “tech-savvy” (i.e., know how to work an app), know how to conduct video therapy, work with Google web-apps, have an MD with a completion of an accredited psychiatry residency, DEA certification, three or more years of providing clinical psychiatry services to patients, and a license to practice psychiatry. The website notes that “licensure in multiple states is highly valued.” So, while many therapists and psychiatrists are able to work in multiple states, as they are licensed in multiple states, this may not be the case for all therapists and psychiatrists. Patients may ask a therapist if they can do “Skype therapy,” which is technically “allowed,” but it’s a tricky area, as it raises some ethical issues. As an added note, all prescribed medications must be prescribed in-person, due to prescribing regulations for telemedicine. It seems psychiatrists and therapists should stick to practicing and treating patients in the states that they are licensed in, even though they are remote. The only difference between remote psychiatrists and remote therapists seems to be the required experience. Therapists must also be tech-savvy, know how to work with web apps, be licensed (multiple states preferred), etc. The difference is, therapists must have a Doctoral or Master’s degree in “psychology, counseling, marriage and family therapy or other relevant field,” the aforementioned license to practice “in good standing” as either a LCSW, LMFT, or as a licensed psychologist, and over three years worth of experience in providing clinical psychotherapy to individuals, families, or couples. Therapists can easily apply for a role via Ginger.io’s website, as can psychiatrists when the positions are open. All therapists and psychiatrists are contract workers and US-based. The application is performed through the Greenhouse platform, which is recruiting software and an applicant tracking system. A lot of Silicon Valley-based companies use Greenhouse. This is keyword-based software, so make sure you are including keywords from the job description in your application – but do it organically, i.e., don’t copy-and-paste. Our motto in getting recruiters, HR, or individuals to pick you out is to do just enough to get noticed. You want to go above and beyond, but not so much so that it’s obvious. It’s a bit difficult to suss out what therapists and psychiatrists make with Ginger.io, unfortunately. The only information on the website is a link to an application. By looking at data from Paysa and Glassdoor, however, it seems that they pay their internal team very fairly. There is some data on Glassdoor stating that a “Health Coach” salary starts at $17 – $21 per hour, which seems low for a therapist or psychiatrist, so it may not be an accurate reflection of the pay. We could also make an educated guess that you set your own rates, and the app takes a percentage or charges you regular fees to use it – but again, that’s just a guess. We recommend contacting their support team at help@ginger.io for questions about pay or how the app works. Like nearly any remote gig, therapists and psychiatrists are able to make their own hours and schedule time with patients at their convenience. It’s definitely not your typical 9 – 5 job, and it seems that, more than anything, it simply helps you reach more patients across your states of practice. Therapy appointments are 50 minutes, and psychiatry appointments are 45 minutes. Follow-ups are 20 minutes. Like any new-ish company or startup, there seem to be good and bad things about the app. Some clients complained about the tech not working, but any app is going to have troubleshooting issues sometimes. What’s interesting about the company itself is that it seems to truly want to stick with its original mission of “saving the world,” as it does seem so paramount to the work that they do. By all accounts, the Ginger.io team seems to truly want to help folks with their mental wellness efforts and therapy. The Ginger.io customer service team responds to all reviews, bad or good, on Glassdoor, and it has pretty great reviews on Facebook as well as on the app store. According to posts by the company on Glassdoor, the company recently went through a managerial shift, which seems to have brought about significant improvements, with the customer service reps citing “accelerated membership” and better mentorship for its internal team. Ultimately, Ginger.io seems to have its heart in the right place – its ultimate goal is to bring its technology to people all across the country, whether they are therapists, psychiatrists, hospitals, or patients. Ginger.io seems like it’s being smart about scaling its growth as well, and take time to figure out how to best use the technology they have for their consumers. This seems like a truly caring company to work with – what more could you ask for? 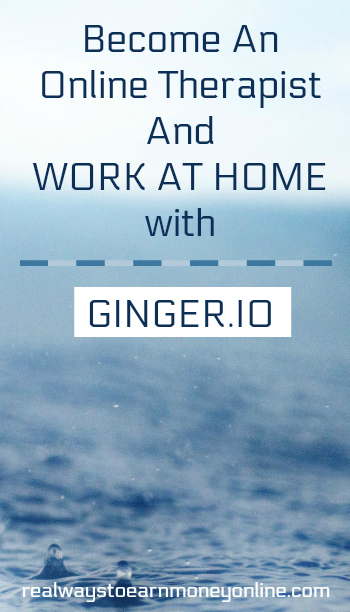 Again, if you are interested in working from home for Ginger.io, go here to check for openings and apply. Check out this inexpensive e-book with a list of 150 companies that regularly hire home-based workers and step-by-step instructions on becoming savvy at finding work at home jobs online yourself. Anna Jones is a bicoastal writer, editor, and producer currently living in Atlanta, GA. She is the proud owner of Girl.Copy, a freelance copywriting and editing business that specializes in creating stellar content in the fashion, technology, marketing, and design sectors. She has a husband, human baby, and fur baby that are her favorite parts of any day. She enjoys traveling, reading, and a nice cold Diet Coke while taking an uninterrupted shower. If you want to internet stalk her or make a business inquiry, check out her website at: www.girlcopy.org.